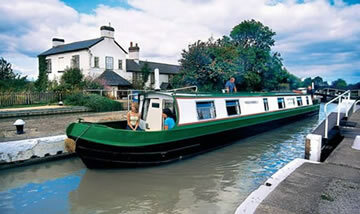 Blakes and Hoseasons English and Welsh Canal Holidays. Criss-crossing this way and that, this secret network of waterways traverse England from Yorkshire to Avon and dip into Wales. Boating on many of the routes allows you to see familiar towns and cities like you've never seen them before. En-route, the countryside constantly passing by is a tapestry of both subtle and dramatic differences, whatever the time of year. Use the boat search facility to find your ideal boat. 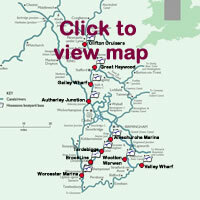 It lists every boat available for hire through Hoseasons and Blakes Boating Holidays on the English and Welsh Canals, including the Kennet and Avon, the Oxford Canal, Grand Union Canal, the Shropshire Union Canal, the Cheshire ring and the Llangollen Canal together with the facility to check availability and latest prices. The Cheshire Ring includes the Peak District and the Pennines. Highlights include The Marple Aqueduct, the picturesque Marple locks and the cruise into the heart of Manchester. Alternatively, the world famous Pontcysylite Aqueduct, the Chirk Tunnel and the enchanting Welsh countryside await you on your journey along the Llangollen Canal. 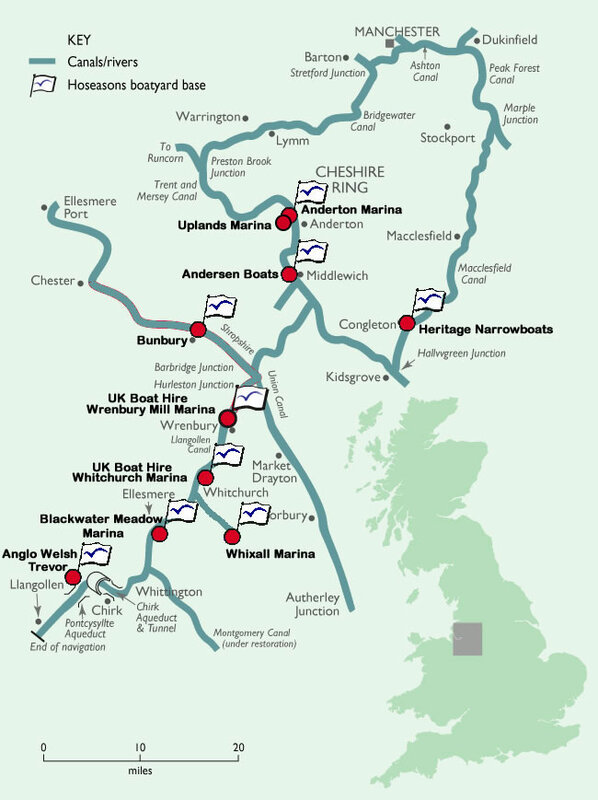 Covering a huge area, choose the northern boatyards to cruise the Four Counties Ring, whilst Burton-On-Trent, Lichfield, Tamworth and the Wedgwood Pottery Centre are all within reach. Choose a southern yard for Stratford Upon Avon, the regenerated waterfront of Birmingham, Tewkesbury and the Black Country Museum in Wolverhampton. 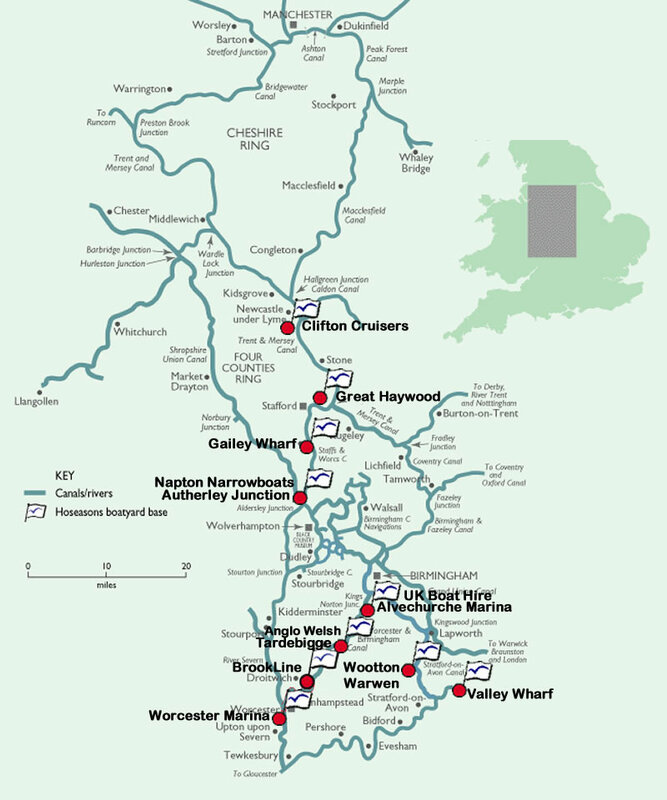 Evesham, Stratford Upon Avon and Warwick are all accessible on the Oxford and Midland Canal system. The dreaming spires of Oxford and Blenheim Palace are a little further or within easy reach of our boatyard at Lower Heyford. The Ashby Canal is further north and offers 22 miles of lock-free waterway before taking you onto the Warwickshire Ring. Coventry, the Canal Museum at Stoke Bruerne and Birmingham's vibrant waterfront are all within striking distance. Bristol and it's Floating Harbour Marina, home to the SS Great Britain, Bristol Aquarium and the Science Centre together with the elegant Georgian buildings of Bath are rightly the main attractions of the Kennet and Avon. At the opposite end is Reading with access to the River Thames. 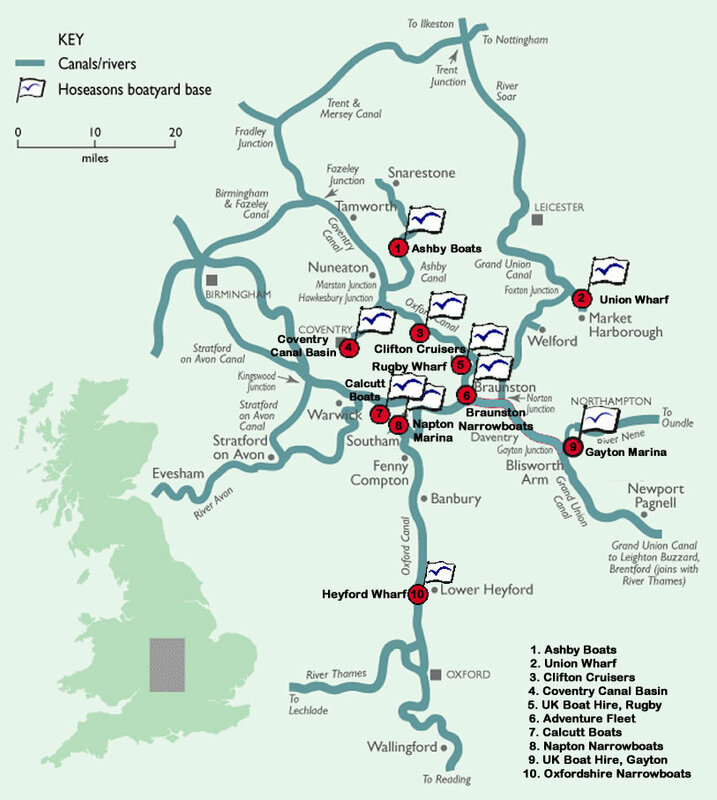 Along the way are the southern Cotswolds, the impressive if demanding Caen Hill Flight of locks and two of John Rennie's architectural masterpieces, the Avoncliff and Dundas Aqueducts.